Brian Ellison, another trainer enjoying a great season, has won the race twice, Batswing (2000) and Carte Wing (2004), and he runs the lightly raced four year old Seamour. Run on the last day of the British Turf flat racing season, it is usually contested on a pretty unforgiving surface, so stamina and an ability to handle testing conditions have usually been a prerequisite,and Saturday’s renewal is unlikely to prove an exception. Mixed messages have come from the Market over the last twenty years. Only two favourites have obliged, but the same period has seen only four winners come home at odds of 20/1 or longer. Good current form has been the rule with virtually all of the last twenty winners registering a top four finish in their penultimate race, the Gosden trained Zuider Zee in 2011 being the most recent exception. Historically three year olds have performed well, registering eleven success’s in the two decades between 1987 and 2007, but have drawn a blank since. The reason for this has been the paucity of the classic generations representatives surviving the cut in recent renewals. If a three year old is to prevail at the weekend the most likely candidate would appear to be the Ralph Beckett trained Argus. Beckett, who is enjoying such a fine season, certainly knows what is required, having trained the three year old, Come On Jonny to win in 2005. Argus who was unraced as a two year old has made steady progress in his five races, culminating with a workman like victory over course and distance two weeks ago in the race which has produced two of the last three winners. Set to race off a mark only 3lbs higher at the weekend, this well bred, and expensively bought colt, has to be on the short list. Mark Johnston, who won with the five year old Quick Ransom in 1993, and the six year old, Yavana’s Place in 1998, tries for a third success with another seasoned campaigner, the five year old ex French gelding, Zand. A winner twice over the distance on soft ground in the French Provinces, he showed some decent form over an inadequate 10f at Newbury in September, finishing a close fifth off a mark of 92. His next two runs, both on the All Weather, at Wolverhampton and Chelmsford, were far from conclusive, as he met trouble in running on both occasions. He races on Saturday off a mark only 1lb higher than Newbury, so hailing from this yard is definitely one to keep on the right side of. Luca Cumani’s very game four year old, Penhill, who will love the ground, ran another fine race at Haydock Park eight weeks ago when getting the better of Buonarroti off a mark of 95, getting up to win by a hard fought 1/2L. It is no certainty that the form will be confirmed on 5lbs worse terms on Saturday, and the Cumani gelding may just find his new mark of 100 a touch beyond him. Andrew Balding’s four year old Shirocco gelding, Storm Force Ten won like a horse going places at Chester in May. Racing over 12 1/2f on soft ground he won easily, and as the third and fourth have both won four races each in the meantime, the form looks gold plated. Off for nearly six months, he finished a disappointing 7 1/2L behind Argus a fortnight ago, but can be expected to improve for the run. 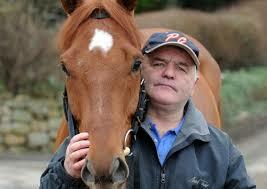 He meets Argus on 3lbs better terms on Saturday, so the 20/1 available at the time of writing may represent some value. Brian Ellison, another trainer enjoying a great season, has won the race twice, Batswing (2000) and Carte Wing (2004),and he runs the lightly raced four year old Seamour. Stamina will not be a problem as he has won twice over 16f, and neither should pace, as he showed loads of it when winning at Haydock in May. We tipped Ellison’s Totalize for the Northumberland Plate. The soft ground he encountered when winning at Ascot seemed a positive and his sixth in the 2m2f Doncaster Cup in his most recent race can be blamed on his failure to get the trip. Only 6lbs higher than his Ascot win he does seem to have a lot in his favour and it will be surprising if he isn’t involved at the business end on Saturday.